Solar Panel Optimisation Explained: Do You Need It? How Do You Get It? Home > Solar Panels > Solar Panel Optimisation: Micro inverters, DC Optimisers, AC Solar Panels & Maxim Explained. 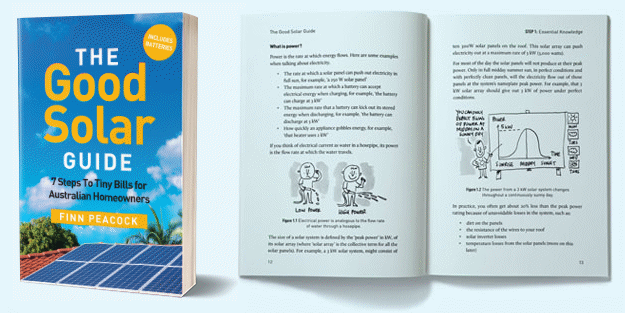 Solar Panel Optimisation: Micro inverters, DC Optimisers, AC Solar Panels & Maxim Explained. Solar Panel Optimisation is an extra feature you can pay for when buying solar that optimises the power output from each panel independently. For the rest of this post, I’ll simply call it PLO. Most people don’t realise that in a conventional solar power system if one panel is performing poorly, all the other modules it shares a ‘string’ with will be dragged down too. The current starts at A and then moves through all 3 panels to B. If one is shaded, that will restrict the current that can pass through the module. Any restriction in a single panel will restrict the current through all the others. If that does not make intuitive sense to you, think of the current in the wire as water in a hose. A shaded panel will ‘pinch the hose’. That means all the panels have less current through them. The practical result of this is that if one is shaded, only operating at 50%, all the panels it its string will now operate at 50% too. 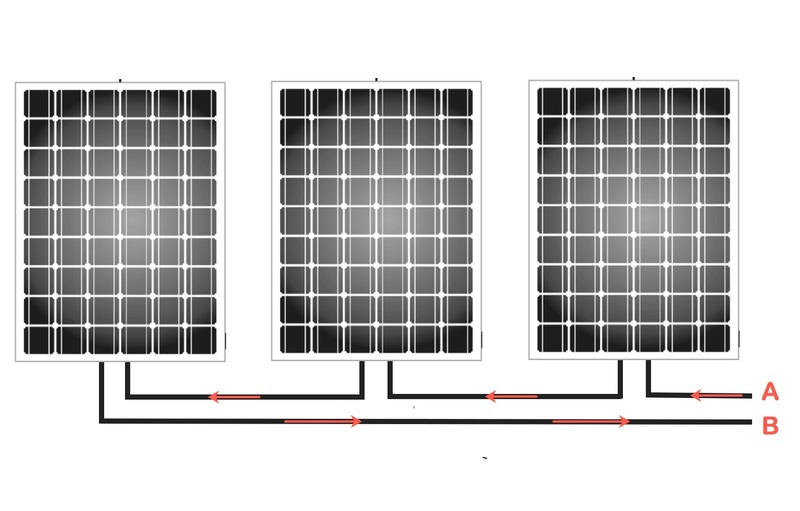 Three solar panels connected together; if one loses output, they all lose output. Some people have suggested to me that bypass diodes solve the problem of one solar panel affecting all the others in the string. Some solar sales people wax lyrical about bypass diodes, especially if they are selling a conventional system and the competition is selling an optimised system. Here’s what you need to know about bypass diodes: they do not optimise the panels individually, the only make the situation a little less bad. What is a bypass diode? Current entering the solar panel has to go through every single cell before it gets out of the module. So if only one of the sixty cells is shaded, the current is restricted through all the cells in the panel. Bummer. These diodes (drawn in green) are like little electronic pressure relief valves. If a cell is blocked, the current will instead move through the closest diode, bypassing a third of the cells. The 3rd cell is shaded, so the current goes through the first bypass diode, bypassing one-third of the panel. Without the bypass diode, the current would stop at the shaded cell and the panel would produce nothing. With 3 bypass diodes, one fully shaded cell will not stop the entire panel passing current. The current will be diverted through the local diode and the solar panel’s voltage and power output will reduce by one third. The panel’s current will stay the same though (P=VI) so it won’t adversely affect the other panels. The problem comes when there is not enough shade to activate the bypass diode. Then power drops and the current through the panel drops with it. This drop in current affects the current in every other panel in the series string. So although bypass diodes help – they only help when you have the ‘right amount’ of shade in the right place. An optimised solar panel system confines the reduced output to just one panel. If you add panel level optimisation, your solar power system will cost more. Now let me explain what each option actually is. 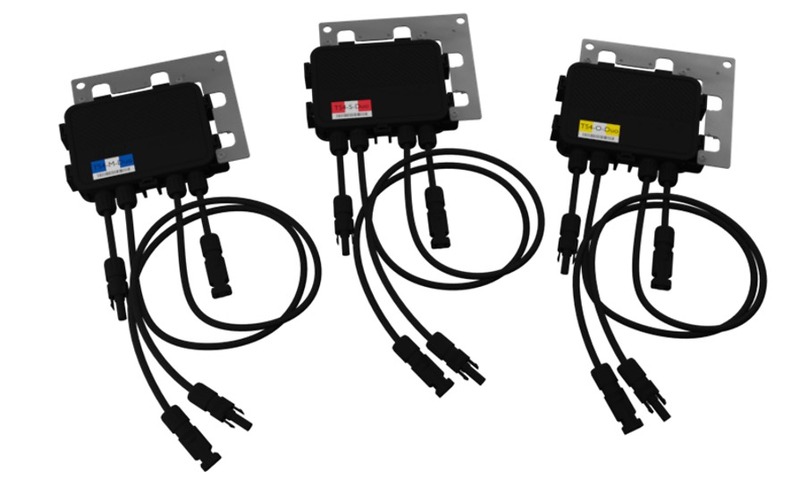 Tigo DC optimisers that bolt onto the back of solar panels. 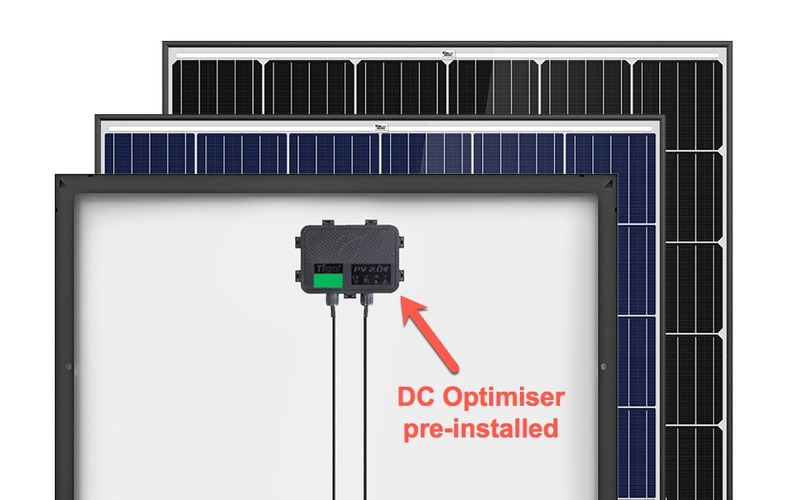 If you choose this option, your installer will attach one DC optimiser to each solar panel, optimising each module’s power output under a wide variety of conditions. 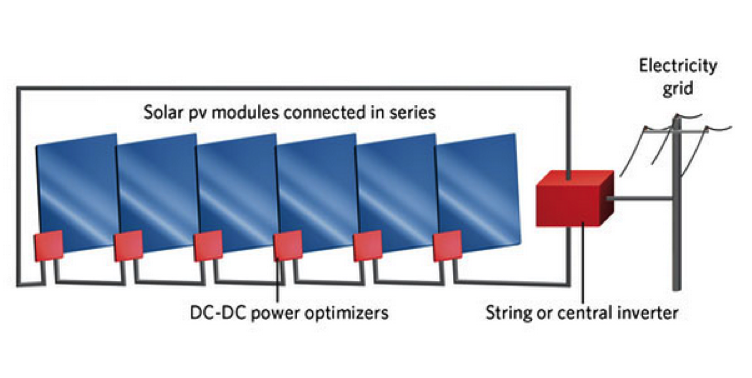 The power generated by all the panels is transmitted at high voltage DC (typically 200-600VDC) and a single, string inverter, typically wall-mounted, does the DC to AC conversion. A solar system with DC optimisers. It still needs a string inverter too. If you want to buy your string inverter and DC optimisers together as one package, then the only game in town is either SolarEdge or the (very new) Huawei. These guys will sell you the inverter and optimisers together, which has the advantage of really schmick software that monitors and controls the whole system. 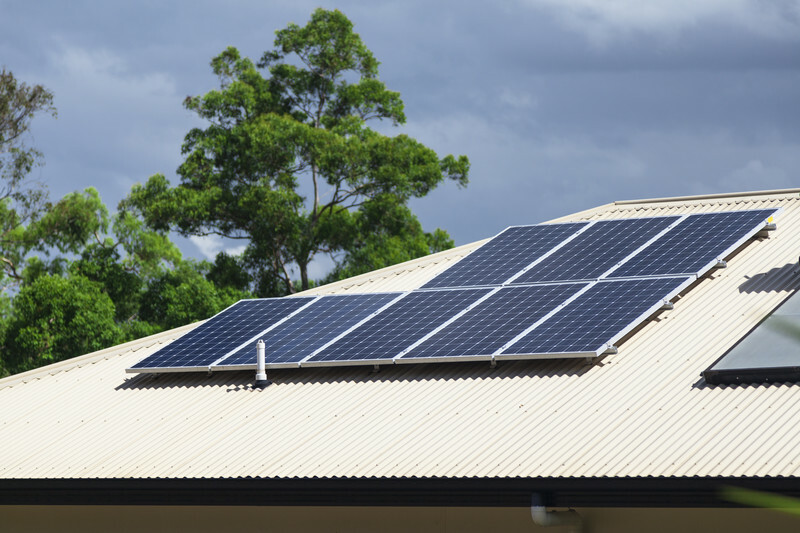 SolarEdge also offer one of the best inverter warranties in Australia at twelve years. If you don’t want to be constrained to using a SolarEdge or Huawei inverter then a company called Tigo makes individual DC optimisers that work with almost any string inverter. They cost about $100 each, and if you want to monitor the optimisers, you’ll also have to shell out about $600 for a central communication unit. Of course, you’ll still have to buy a string inverter too. The biggest advantage of a DC optimiser that is independent of the string inverter – like Tigo – is you don’t have to put them on every solar panel. If you have an installation in which only a few panels will get shade, then you can only add optimisers to those – saving lots of money compared to putting them on every module. Savvy solar installers often do this to reduce the effect of stink pipes, TV aerials and chimneys on the system output. To minimise the effect of the stink-pipe you only need to add DC optimisers to the panels that it casts shade on to. A ‘smart panel’ is a simply a regular solar panel with a DC optimiser (probably made by Tigo) pre-installed at the factory. They can be used with a string inverter of your choice and are usually cheaper than buying the optimiser and module separately. A smart panel with DC optimiser pre-installed at the factory. Maxim is a microchip company that in 2016 invented a little chip that can optimise the power in an individual solar panel. In fact, they claim that replacing the three bypass diodes in a typical module with three of their chips will optimise the power at the solar-cell-string level. In a Maxim panel these 3 microchips replace the bypass diodes. 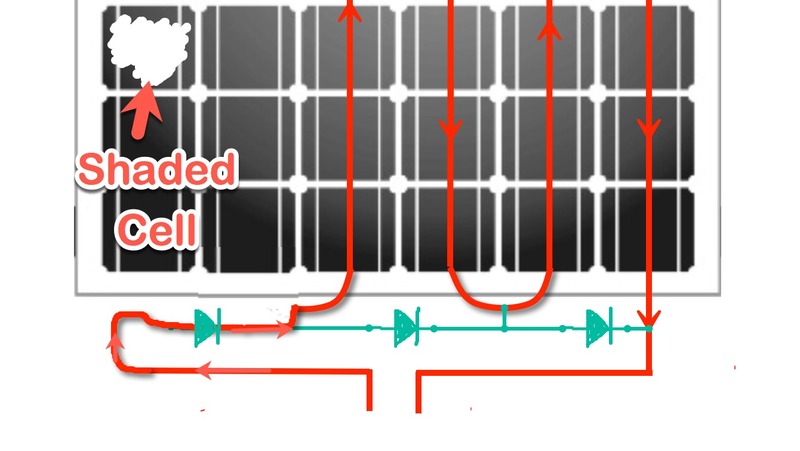 As you’ve already seen, a cell-string is typically a third of the solar panel. If the current is reduced though a cell due to shading, a Maxim panel will get as much power as it can from the shaded cell-string while still allowing the other two cell-strings to perform at full power. So a Maxim smart panel, as well as ensuring that one shaded panel will not bring down the others in a string, will under many circumstances get more power from the partially shaded module too because it won’t simply bypass a third of it, but get as much power as it can from the shaded cell-string. 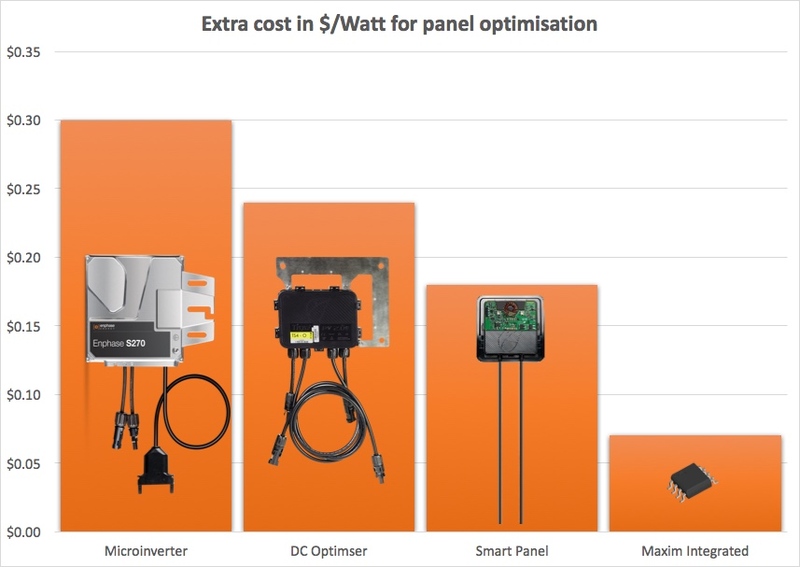 The extra cost for Maxim smart panel optimisation is about $70 per kW. Maxim don’t manufacture the panels; they sell their chips to module manufacturers – at the time of writing, Jinko Solar, Trina Solar, Suntech and ET Solar. This is the cheapest way to get panel level optimisation. The downside is that we are seeing major TV reception issues with Maxim solar panels, to the extent that Jinko have decided not to sell them in Australia anymore and Trina, Suntech and ET have gone very quiet on their Maxim panels in Australia. So if you really want Maxim modules, you will struggle to find any in Australia at time of writing. Which is a shame because they are a great value and effective solar panel optimisation solution (for people who don’t watch broadcast TV!). 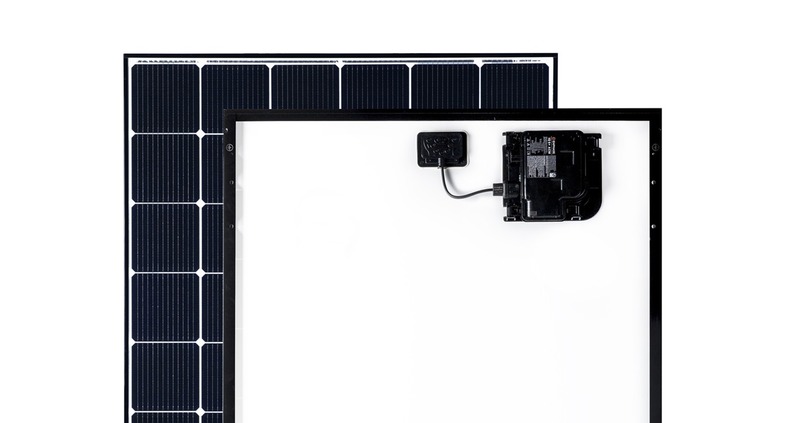 A microinverter on the back of a solar panel. Microinverters keep everything at 230V AC. No string inverter required. The power generated is transmitted at 230V AC (not 200-600V DC) from each micro-inverter and connected in parallel, then connected directly to your switchboard. No central point of failure. If one micro fails you only lose that solar panel. If a string inverter fails you lose the whole system. Which PLO should you choose? Maxim panels are out of the contest, because you just can’t seem to get them in Australia. So that leaves DC optimisers (integrated or discrete) vs. microinverters. Back in 2015 I put together this infographic to help you decide (and this blog post too). If you need help deciding on a PLO solution they are a great resource. Do you need Panel Level Optimisation At All? If you have a simple roof facing 1 or 2 (or possibly 3) directions with no shade, then there is no pressing need to spend more on PLO. If you have a simple roof with no shade, and want to squeeze 8-12% more energy from your solar panels, then PLO can do that by simply optimising everything better (by better coping with panel manufacturing mismatch, cloud cover, dirt etc.). If you have a complicated roof, with lots of roof faces and/or lots of shade objects (flues, aerials, ventilation etc.) then PLO is a good idea. If you only have one or two small shading objects that will only shade a handful of panels, then retrofitting Tigo DC optimisers to the affected solar panels is the most cost effective solution. Microinverters and DC optimisers offer panel level monitoring, so you can see the power of each module on your monitoring. If that is important to you, then get it. But in my experience it soon gets boring! All well-installed solar systems are relatively safe. But microniverter systems are even safer by design (no high DC voltage), and DC optimisers and microinverters both shut down the solar panels fully in fault conditions – increasing their safety. So if that is important to you, consider PLO. What have I got? On the house I live in I chose to install microinverters. The main reason being that the house is made of straw, and I didn’t like the thought of 600V DC going through the bales. But normal people without weird homes shouldn’t be too concerned – as already mentioned, a well installed DC system is perfectly safe. 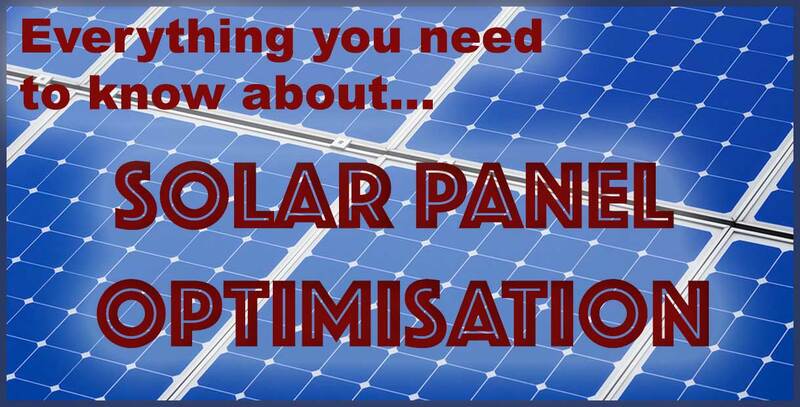 So now you know everything you need to know about solar panel optimisation, or PLO, you can decide for yourself if you need or want it and if so which flavour to get. What have you chosen and why? Let rip in the comments. [What have I got? On the house I live in I chose to install microinverters. The main reason being that the house is made of straw, and I didn’t like the thought of 600V DC going through the bales.] Yep, and since 2013, I have a microinverter-based system, too. The system has never been down 100%. Plus, I built it in subsets, and now am happy with 6 strings, 20,000-Watts of AC power. In 2019, I plan on retrofitting my system to give me a 10kW microgrid, that is, when the utility grid goes down, my solar will continue to operate — powerful. From recent blurbs at the Enphase shareholder meeting, it looks like all you will need is a single IQ8 battery or IQ8 microinverter plus the addition of an IQ Envoy, and it will be able to put all of the microinverters into the microgrid. I am hopeful. I always look at microinverters 100% decentralized power topology as a Cadillac solution, plus all the devices in my home were AC, so it made sense to have AC coming off of the roof. DC arc faults are real safety hazards, and, of course, a newly installed solar PV system is perfect and powerful, but put 10 years on it in Florida tropics, and the idea of a DC arc fault is very real. AC is the way to go. Great article Finn from the Land Down Under! Cheers from the States! The Tigo product works well, but the company is let down by an awefull warranty claim process. The amount of ‘testing’ a installer needs to do (uncompensated) to prove a fault makes it a product that is essentially a liability to an installer who offers an extended workmanship warranty. It is a shame as the product is good and the software consumer friendly. see if they need to do something with the software or if there is a bad optimizer. I have never had the level of support I get with them with any company selling anything. I can’t say enough good things about them. I have a solaredge system with DC optimisers and very happy with it. One thing that seems to occur and is rarely mentioned is the effect of the house next door, shading solar panels. Any solar installer worth their salt should take shading into account when siting panels. So it sounds like your installer got a little salt they weren’t entitled to if they had the option of placing the panels higher. That said, all else equal, it is best to avoid placing panels close to the roof crest as wind loading can be high there. This is especially important in cyclone areas. Most if not all solar installs i see around here do the same thing. Panels low on the roof line. We are not in a high wind area either. I get awesome efficency from my Enphase Micro system even on the crappy winter day it will register a resonable amount of Solar, looking forward to seeing how the new I.Q range Enphase Micros go ! for me the nephase may be a bit more to spend but the simplicity of the application is a winner! Just a couple of points to add. One advantage of micro inverters that you didn’t mention is that you can add more panels to your system very easily without having to upgrade your inverter. And an advantage of any type of PLO (I was told this by a Tigo rep so I’ll be interested in your opinion) is that, as the panels degrade over time, they tend to degrade at different rates which leads to ‘voltage mismatches’ between the panels. Apparently this is bad but PLO is good because it fixes it. Also you dismissed panel-level monitoring as something that only geeks and nerds like you an me would be interested in but I think everyone would want to know if one of their panels was underperforming and with PLO it’s easy to find out which one is causing the problem. One question, with the Maxim chips, do you get the same sort of panel-level monitoring and fault detection as with optimisers or micro’s? Unfortunately there’s no panel level monitoring or fault detection with Maxim panel string optimization. It’s a trade off for lower cost. Actually I don’t deserve any cheers as it was Finn who wrote the article. One Stop Solar Warehouse has the Huawei optimizers on their site and others may as well. I have TrinaPeak panels (Maxium optimised). I don’t have TV interference issues people are talking about with either an attenna facing Dandenong or Melbourne (Bourke St) with 2 sets of frequencies. Maybe people’s mileage varies or maybe the implementation on the panel is the issue. Hopefully Trina has the interference problem sorted. But generally it was only people with weak TV reception who had problems so your signal may be strong enough to avoid problems. Hard to say. Hi Finn. Love you work. have been reading your blog for years and would have to say I have agreed with everything you have said up until today. I would have thought that if I had a good MPPT and the inverter let the voltage go down by the amount of shaded Cells the rest of the panels would still supply full current thought the bypass diode and not reduce their output. Maybe I’m wrong and MTTP aren’t that smart and just look near Voc. Think I will have to run some experiments to see if you have indead sold out to the optimizer crowd. A 3 Kw system plus microinverters were installed in 2013 here – we needed microinverters (this was unfortunately pre DC optimisers) due to two large trees on another property providing random shading at no extra cost (to them). Initially the new system would only monitor the panels on the north or east, never both. Then the daytime TV reception was so poor that the installer spent an entire day footling around until (between us) we worked out the interference was on the same plane as the microinverters. Then we removed the original TV antennas and installed another much taller post to get “out of inverter range”. Pity I hadn’t also checked the radio reception – it was still lousy. I had a fair amount of mu metal (good RF shielding) so I shielded the microinverters to fix the radio reception. Result – good radio, no panels could be monitored. Why the manufacturers can’t use a basic cat5 network cable instead of wireless for monitoring is unfathomable to me. So I thought I would change over to optimisers and allow for future expansion – mainly for battery backup and charging an electric vehicle. So our “beloved” power company refused to allow me to install a 3 phase 27.6Kw Solaredge inverter (needed for both EV and some high amperage 3 phase gear here) because the DC voltage is more than their recommended maximum “on the roof”. The inverter has TUV approval, however the regulator in the West is above such trivia. This is despite the fact that I can legally install 15Kw of panels as we have a 3 phase wiring system. Finally late last year they approved the Solaredge after 30 months of pressure from me (and undoubtedly quite a few others). Currently I am building a 2 storey “mini dwelling” out the back and the whole thing will never see the grid… and all the heavy duty gear will be run off that instead of the original house. Much more of this snafu and the original house will also go off grid (complete with a second DC optimiser setup – temperature strips on the microinverters exceeded 100 Celsius in summer in 2015 – and all the years since have been hotter. I reckon I have been luchy to only blow 2 of the 6 microinverters so far. Unsuitable technology for summer in the West in my view. Between the smart meter fiasco (we get a measly 7cents feed in tariff and get slugged 29 cents for imported power) and all the hassles above, the electricity regulators in the West have clearly demonstrated an utter failure to support new technology or their customers needs. So here I am counting the days… one brick at a time. The second half of : >> With 3 bypass diodes, one fully shaded cell will not stop the entire panel passing current, instead its output will reduce by one third. has lost me. As a string of panels is a string of three times as many 1/3 panels in series, a good bypass diode avoids any current restriction, with the only consequence of a dead 1/3 panel being reduction of the string voltage by 1/3 of a panel plus 1v diode drop. (OK, the diode would drop around 0.6 to 0.7v at low current, but at full string current you'll see around a volt.) That voltage reduction is 1/3 less power for one panel, 1/6 less power for two panels, and 1/30 less power for ten panels in the string. If two strings were parallelled on one inverter string input, then the MPPT would have to tune to the lower voltage to pull _any_ current from the weak string, reducing the power drawn from the stronger string by 1/n also. So, yes, I can see that the whole array on that inverter string input is affected, but the impact will only be 1/n, where n = series_panels * 3, if solar glare isn't distorting my view of this effect. Original article: “Without the bypass diode, the current would stop at the shaded cell and the panel would produce nothing. With 3 bypass diodes, one fully shaded cell will not stop the entire panel passing current, instead its output will reduce by one third. The 3rd paragraph is incorrect.1 fully-shaded cell/section reduces the value of that 1 bypassed section alone i.e. about 10V in the string voltage-under-load for a 60-cell panel with 3 BDs. The current flow is not affected, so the loss in power for *BOTH* the panel and the whole string will be 1/3rd of what that one panel would normally produce under this level of irradiation.The MPPT point will adjust and I believe the MPP V would then be 10V lower in this MPPT channel. Of course, the more DB sections that are being bypassed, the more 1/3rd panel V and 1/3rd-panel P contributions to the string’s total V & total P that are being lost. Eventually, the string V will drop below the range that MPPT operates within, causing even more P loss. And, finally, the string V will fall below the min. inverter operating V.
I’ve recently taken up your offer of 3 quotes, for a new build on a block where a neighbour’s large (“significant”) gum tree is likely to provide morning shading. 1) What tools are readily available to me to assess potential shading? 2) Have you come across these particular panels? I couldn’t see a review for the specific model – but maybe I was having a man’s look…. 3) Are microinverters significantly more prone to failure than monolithic string inverters, or is it likely to be a combination of more articles to fail and more inconvenient to replace, that weigh against them from a reliability perspective? 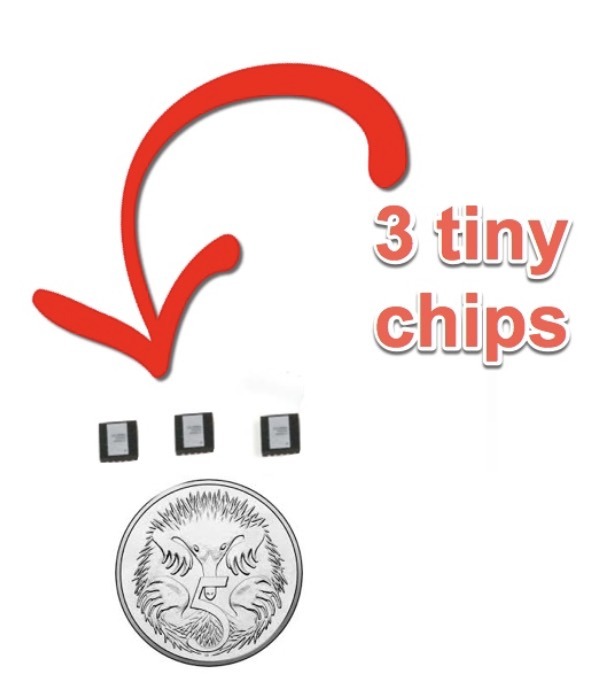 4) “second generation Maxim chipset” – is much known about this? The good news is, because it is winter, the shading from the tree won’t be much worse than it is now so you can get a good idea of its worst extent (assuming the tree isn’t going to grow much more). If you are in Queensland you can require neighbors trim or remove trees shading your property. Hopefully your installer has already used this or a similar tool. If not we may still have one we can lend. Some microinverters haven’t performed well but generally I would say they are now reliable. I’d suggest making sure they come with a 10 year warranty though. You are right that having multiple inverters increases the chance of one failing, but the others will keep on functioning. 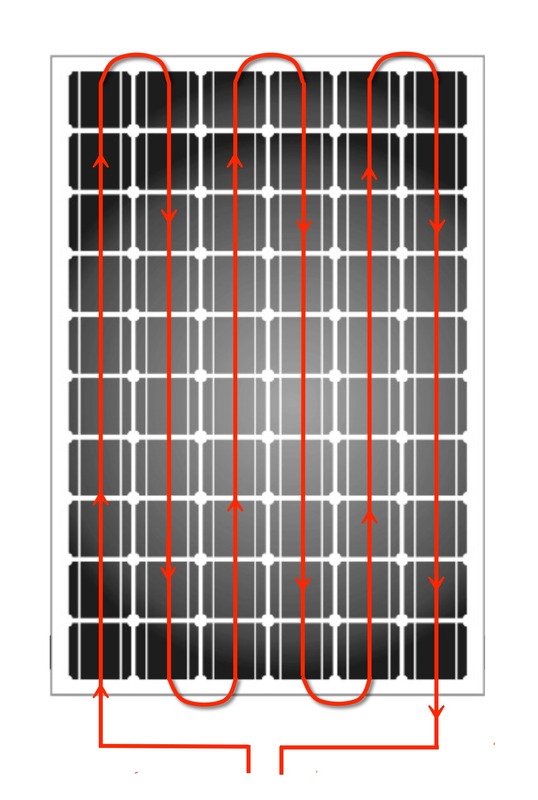 Maxim optimized panels can give most of the benefits of microinverters at a lower cost. Most people did not have trouble with interference even with the first generation ones but I don’t know how well the second generation performs. If you get them and have problems please let me know. I spoke to a Maxim representative and he was quite confident they would last for the life of the panel. I take it you want to put optimizers on your existing solar system? Tigo is the most commonly used optimizer with possibly Huawei coming in second. The bad news is it will be quite expensive to add them to an existing system. With 24 panels it will add up. 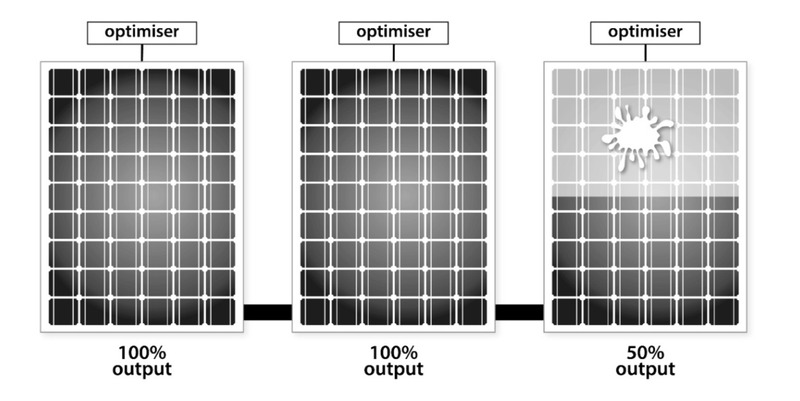 Ideally optimizers might increase the output of your system by 25% but a result of half that is more likely. If you are going to “upgrade” your existing system with optimizers, you may want to wait for IQ8 micros. Although it might be more expensive than just adding optimizers, you’ll get microgrid capability. You’ll need to add an Encharge Switch and an IQ Envoy, too. IQ8 will be the cure for “anti-islanding”!